This is the classic English apple, often regarded as the finest of all apples. It sets the benchmark for flavor in apples to which all others aspire. The aromatic complexity and depth of flavors in a good Cox's Orange Pippin are remarkable. In our personal experience pear, melon, freshly-squeezed orange juice, and mango are all readily evident in a good example. Cox's Orange Pippin is a mid/late season variety and is probably at its best if picked when fully ripe, or picked slightly under-ripe and left in storage for a month or so - it is not a long-keeper though. Although primarily considered a variety for eating fresh, Cox is an excellent apple for juice / cider blends as well. It is also a versatile culinary apple, with an inherently sweet flavor when baked, and is a common ingredient in English apple preserves, chutneys, and mincemeat. Fill in the details below and we will let you know when Cox's Orange Pippin apple trees are back in stock. The main issue with growing Cox's Orange Pippin is its relatively poor disease resistance. It can be grown without any treatments but cropping may then be lighter - which is not necessarily a bad thing because lighter crops sometimes develop better flavor. Although forever associated with England, Cox can be grown in warm climates, and indeed seems to do better in warmer and drier conditions than are generally found in England. However enthusiasts believe (with some justification) that the unique flavor can only be fully developed in the marginal climate of a typical English summer. 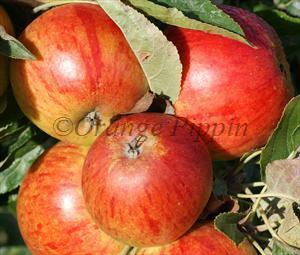 In North America that means Cox's Orange Pippin does best in the cooler zones. See our article on growing English apples in North America for further advice. The bottom line is that if you are serious about apples then you absolutely must try growing Cox's Orange Pippin, because it is the benchmark for apple flavor. Raised by Richard Cox, in Buckinghamshire, England, in the early 19th century. The parentage is unknown but it is possibly a seedling of Ribston Pippin. A modern self-fertile form of the renowned Cox's Orange Pippin, with arguably even better flavor. A handsome English apple from the 18th century.